Another year, another round of moments to remember and to give gratitude to. It has been quite an eventful year, education transition, forging new friendships and having so many "firsts". Childhood idol since primary school, of course should go and see Avril performed live. Thanks YX for accompany me for going to the concert. First event job I think. Nice to see people from different countries coming to Singapore for the event, interacting with them in some way and meet really nice and kind people to work with. The long awaited graduation. Bittersweet feeling but overall I'm glad I completed a diploma course and gain so much from learning new knowledge and creating new memories with new found friends that will probably last a lifetime. Thankful for the good lecturers and tutors too. Not everyone came but still first time to USS with a bigger group so it was a good chance to bond and make even more good memories together. Heh heh. Transition to Uni life was kinda bumpy since I'm taking a whole new course. Lucky I went for the orientation camps and got to know the school better and hanging out with seniors and freshmen. Probably has been a long time in awhile where I experienced so many embarrassing and awkward moments. Just thinking of the silly things we do to get more points just made me feel embarrassed all over again but yet it was fun and exciting, however to even strike a conversation with them seems difficult and so thoroughly awkward now. Probably it is just me feeling this way. Haha. Another camp which is much bigger in scale and meeting my course mates. Yup, another series of mortifying moments made and I'm still like an awkward turtle. Meeting another group of kind seniors and freshmen really made it another awesome camp. This conclude the last segment of orientation, first time in a club and my platforms break. Free admission so why not? Kang Gary and Jung In performed live and in sync. Best time ever. Thanks HF for sharing this moment with me. Thought I would never need to run long distance again. Well, I accomplished yet another milestone of 10km. Thanks to getting the chance to learn more about social work, I got to visit the social services/agencies. Hats off to all the social workers, their job seriously ain't easy and finally learnt the difference between social workers and volunteers. This is like my most prized possession right now. 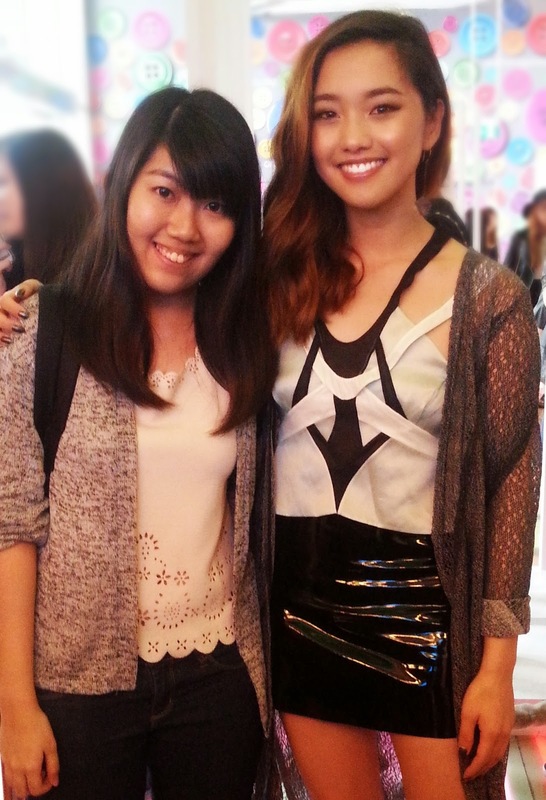 So glad I went ahead to meet Jenn when she came to Singapore. Hopefully will get another chance to see her in 2015. Hehes. Ta-da I'm showing the photo again, it was just a really wonderful feeling. Another event job I'm grateful to be a part of since it had to do with music and super talented and young kids playing violins. Meeting yet another group of nice and good people to work with. Asked by my friend to join and although had to wake up real early but seeing the elderly so united and accompany them to go for a stroll with an ocean view was satisfying. They perhaps don't have much chances to go out and explore so going on this trip should be meaningful ad refreshing for them. Thank you DJ for accompany me on this trip. Last but not least, since last year already spent the New year countdown at Marina Bay Float, this year I got to stay over at YX's home and countdown together in front of TV. BIGBANG in HD, no need to squeeze with the crowd, enjoyed at the comfort at home felt good too. Thank you YX for the invite! Surprisingly, this year had quite a lot of good things happening. Totally appreciative of all of it and may 2015 be a even better year ahead for all of us.